Facebook is social network where you connect with you friends and family. People on Facebook share their daily stories like updating status, photos and videos etc. You keep yourself update by using Facebook daily, to make your news feed more interesting you like famous celebrities fan pages, like SRK, Kareena Kapoor, Akcent etc. There are a lot of number of pages created by people to share different types of stuff on Facebook. While using Facebook on your Smartphone you watch funny videos, amazing videos, songs, clips, technology related news and you want to save these videos in your Mobile (Android, IPhone, and Tablet). You later use these videos to send to your friends on whatsapp , skype , viber or any other network to amuse your friends. So here while using Facebook app you can download these videos easily by just one click. How to Download Facebook Video with FVD? 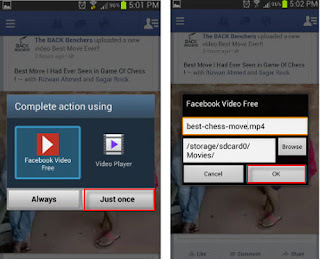 FVD (Free video Downloader) is app which allow you to download Facebook videos on your smart phone. Step1: You just need to install this application from here. Step2: open Facebook app on your Mobile and click on any video. Step5: Your video save in your gallery you can watch it later, Enjoy. Thank you hope you enjoy this Topic.